This lager harmoniously combines lager yeast fermentation and west coast IPA hops. Our India style Pale Lager is like a traditional IPA but with a twist - it's fermented cold and aged for extended periods. A blend of classic American hops creates a huge tropical fruit and citrusy hop aroma. A dry finish accentuates the pleasant bitterness and hop profile. 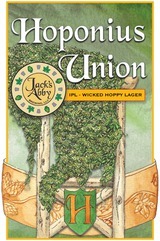 Hoponius Union uses locally grown dehulled spelt from MA.